In a follow-up to the 50th International Eucharistic Congress 2012, which was held in Dublin in June, a three-day National Pastoral Conference called ‘Communion and Co-responsibility in the Church’ has been organised by the Bishops’ Council for Pastoral Renewal & Adult Faith Development, in cooperation with the Bishops’ Council for Justice and Peace. The National Pastoral Conference will take place from Thursday to Saturday of this week in the Sheraton Hotel, Athlone, in the Diocese of Ardagh and Clonmacnois. The aim of the National Pastoral Conference is to support the work of renewal and reform in the Church in Ireland at this time. In particular the conference seeks to help participants to work together in their own situations – as ordained, lay and religious – towards becoming increasingly a Church of communion and co-responsibility. This event also marks the 50th anniversary of the opening of the Second Vatican Council as well as the forthcoming launch in Rome on 11 October by the Holy Father Pope Benedict XVI of the universal ‘Year of Faith’. Over 200 people from all over Ireland – approximately half lay people – will be involved in this National Pastoral Conference which will be hosted jointly by Bishop Seamus Freeman, Bishop of Ossory and chair of the Council for Pastoral Renewal & Adult Faith Development; and Bishop Raymond Field, auxiliary bishop of the Archdiocese of Dublin and chair of the Council for Justice and Peace. Bishop Colm O’Reilly, Bishop of Ardagh and Clonmacnoise, will welcome the gathering and preside at the conference Eucharist at Saint Mary’s Church in Athlone on Friday. While the emphasis throughout the conference will be on conversation, reflection and dialogue, internationally acclaimed Catholic theologian Dr Richard Gaillardetz from Boston College has been invited to speak on four topics in the course of the three days. These are: Vatican II as a model for the Church; communion and co-responsibility in the Church; mission and discipleship; and, ministry today. 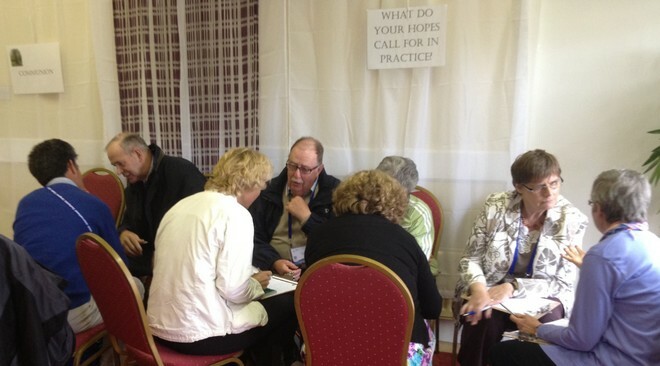 The Council for Pastoral Renewal and Adult Faith Development supports on-going dialogue and reflection on current, relevant topics between all groups and agencies. On behalf of the Bishops’ Conference, the Council promotes frameworks which are aimed at on-going development of shared vision as well as pastoral priorities and strategies at national level. Areas for research, reflection and supportive action by the Council include evangelisation, adult faith development, parish development, lay discipleship and ministry, and the young Church. The role of the Council for Justice and Peace is to assist the Church in responding to the challenges facing it in the areas of human rights, social justice in Ireland and internationally, peace, including peace education, and world development. Its main activities are in research, education and information. Richard Gaillardetz is the McCarthy Professor of Catholic Systematic Theology at Boston College. Dr Gaillardetz previously taught at the University of Toledo from 2001 to 2011 as the Thomas and Margaret Murray and James J Bacik Professor of Catholic Studies at the University of Toledo and the University of Saint Thomas Graduate School of Theology in Houston from 1991-2001. He received a BA in Humanities from University of Texas, an MA in Biblical Theology from Saint Mary’s University in San Antonio, and both an MA and PhD from the University of Notre Dame in Systematic Theology. He has published numerous articles and is the author of eight books. Dr Gaillardetz was a Catholic delegate on the US Catholic – Methodist Dialogue 2000-2005. He served on the Board of Directors of the Catholic Theological Society of America (CTSA) from 2006 to 2008 and in June of 2012 he became the President-Elect of the CTSA. He has received numerous awards from the Catholic Press Association for articles he has written and is a past recipient of the Sophia Award (2000), offered annually by the faculty of the Washington Theological Union in Washington DC in recognition of a theologian’s contributions to the life of the Church. Dr Gaillardetz is a popular speaker at theological and pastoral conferences. Dr Gaillardetz is married to Diana and they have four children.